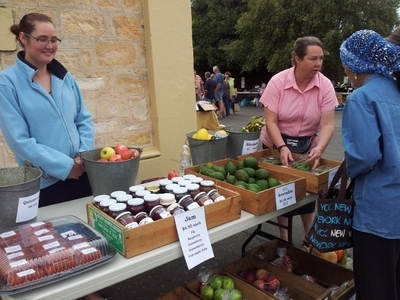 A wonderful way to say 'Hello' and give recognition and reward the various market gardeners and primary producers in South Australia for their top quality fresh produce is to support their stalls at our various community markets. 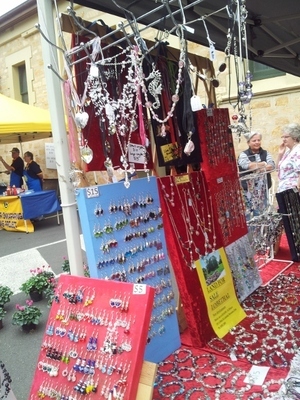 Adelaide is blessed with several community markets, and to name just some; The Adelaide Showground Farmers' Market, Norwood Community Markets, and Gilles Street Market all have their unique and friendly appeal to shoppers. If you love markets for their variety of produce and wares with a friendly country atmosphere then The Lions' Market at Woodside is the place for you to visit on the 3rd Saturday of each month. 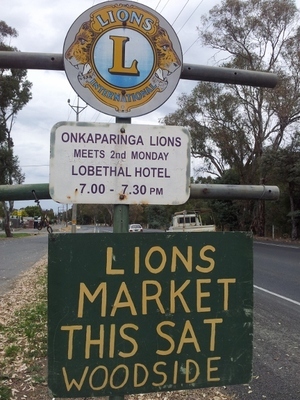 The Lions' Market at Woodside is located in the Woodside Institute Hall and the surrounding outside area, on the corner of Onkaparinga Valley Road and Nairn Road. You will find there is a large variety of stalls with various items from books, clothing and any number of handcrafted items to capture your interest. From wonderful selection of fresh fruit, vegetables, home baked cakes and pastries, bakery made cakes, pastries and bread, not forgeting that some of the local hills produce growers and gardeners come from far and wide to sell their fresh fruit, vegetables, bulbs and plants at this market. 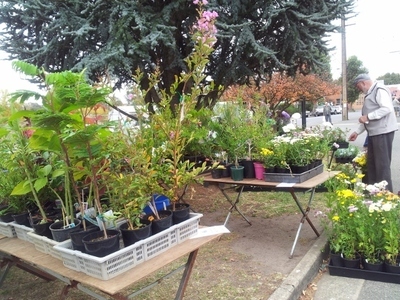 Plenty of plants to choose from. If you are a keen gardener there are plenty of plants to choose from and lots of expert advice from nursery people in the know. Tim Marshman of Down To Earth Plant Sales. 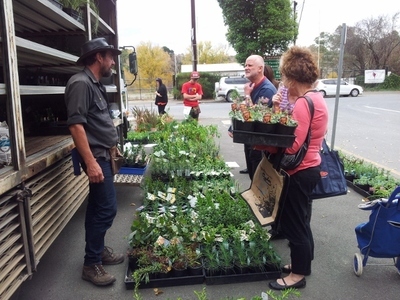 Tim Marshman from Down to Earth literally brings his extensive range of native plants to market by the truck load. I have purchased top quality native plants from Tim over many years and have found his gardening advice and suggestions invaluable. 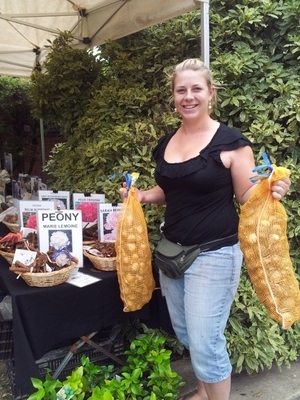 Megan the owner/manager of Bulbs Direct is a regular trader at weekend community markets who offers a huge collection of rare and unusual bulbs, tulips, daffodils, freesia, peony and many more that she sources from the best growers in Australia. With winter upon us she has a large range of winter and potted bulbs available. 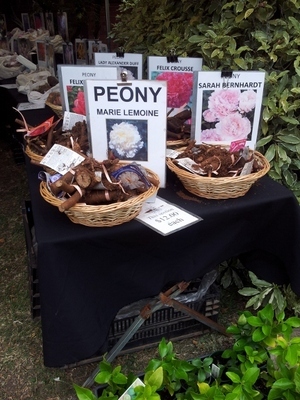 Large range of rare and unusual bulbs on offer. 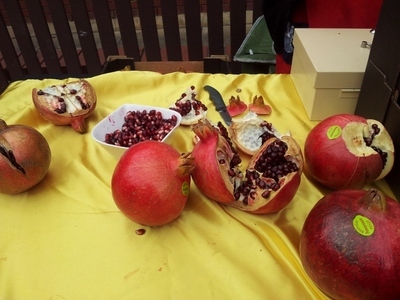 There is so much variety of produce from growers, such as Anat from PomiGold Woodside SA , a local grower of pomegranates, 100% Australian fruit. For those interested in a healthy diet, pomegranate is high in fibre, vitamin C and niacin and has 3 times the total antioxidant of green tea or red wine. 100% Australian Fruit, locally grown. The Mason Family are sixth generation orchardists at Forest Range who grow a large variety of apples including old varieties like Jonnies, which are generally unavailable at shops. They also grow cherries commercially and have shed door sales when in season. Depending on the time of year other fruits are available, including stone fruit: peaches, nectarine, plum, apricot plus figs, pears, quinces, raspberries, boysenberries, persimmon and kiwi fruit. 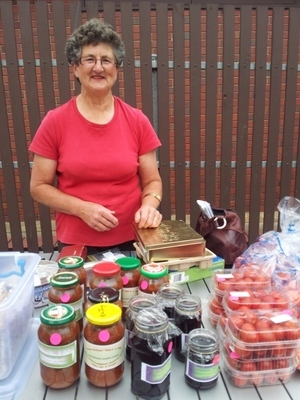 Alison and Diana Mason's homemade jams and fresh produce. 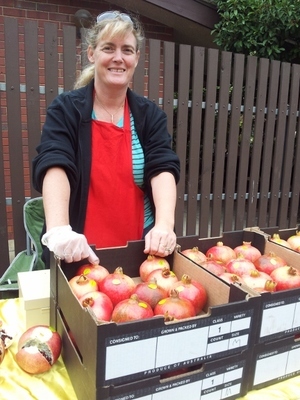 Alison and Diana Mason have only recently begun selling at the Lions Woodside Market, but due to the wonderful response are intending to expand into other community markets. Besides their fresh fruit, it is worth your while checking out their luscious range of homemade jams. 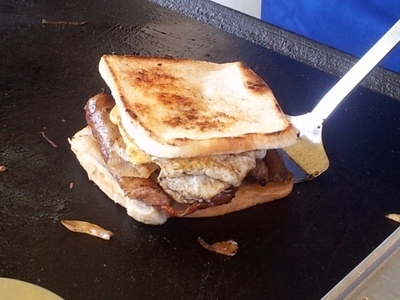 A very popular and regular tradition at community markets - and Lions Market at Woodside is no exception - is the sheer joy of having either breakfast, brunch or lunch at the market; the choice is yours, and if you just can't make your mind up, you can always decide on take-away. 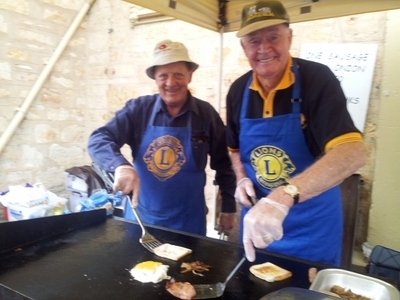 The local Lions volunteers can be seen cooking on site their very popular tasty toasted grilled, sausage, bacon, egg and onion sandwiches. 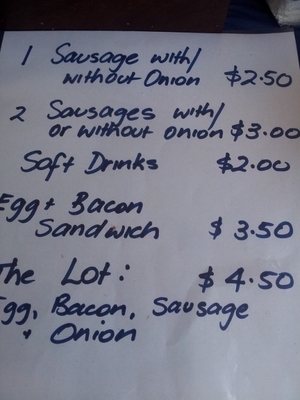 Lions stall; popular for breakfast or brunch. A Lion's Brekkie, with the lot. There is a plentiful range of appetising foods to take home. 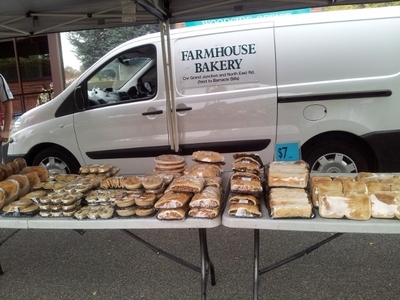 For over four years, Farmhouse Bakery have covered the hills and country markets from Woodside to Clare. 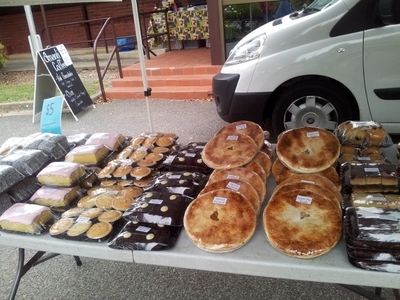 They have a large range of savoury pastries, fruit pies, fresh loaves of bread to take away and enjoy. Farmhouse Bakery for freshly baked foods. Range of savoury and sweet pastries. 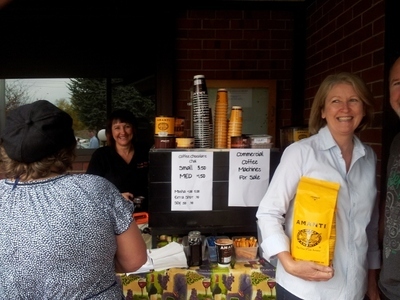 Amanti Coffee at your service. 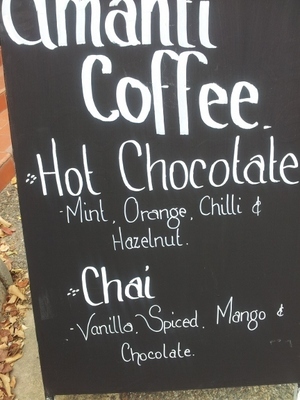 You can't even consider visiting the numerous stalls without partaking in a fresh coffee from Barista, Deane. I guess we all have our opinion on who makes the best coffee around town, well, Deane is in a class of her own for great coffee and exceptional friendly service. Deane and some happy customers. It is worth checking out Lions' Member, Eileen Williams' stall; her range of home nurtured Lebanese egg plants, organic tomatoes and pumpkins are legendary. Then there is of course her homemade chutneys, and range of apricot, peach and logan berry jams. Eileen's famous for her organic vegies and homemade jams. 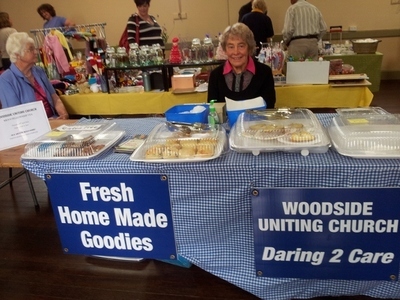 Inside and outside the Woodside Institute you will find various stalls offering an extensive selection of handmade clothing, jewellery, candles, books, soaps and the range goes on. Inside the Woodside Institue for more treasures. 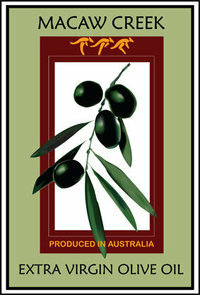 Macaw Creek Award Winning Olive Oil. There is a variety of things to take home, such as Extra Virgin Olive Oil from Macraw Creek . 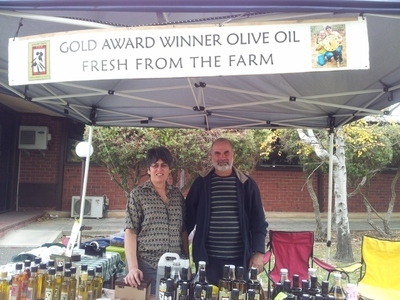 Owners, Dalia and Zvi Sela take real pride in their Award Winning Olive Oil grown in South Australia's Gilbert Valley, which has no added chemicals, is free from preservatives, contains anti-oxidants and is suitable for all types of cooking, frying, marinades, salads and sauces. Dalia and Zvi Sela of Macaw Creek. For those of us who take pride in our gardens and use organic manure to enrich the soil, we have available to us at Woodside Market a choice of either pig or sheep manure. 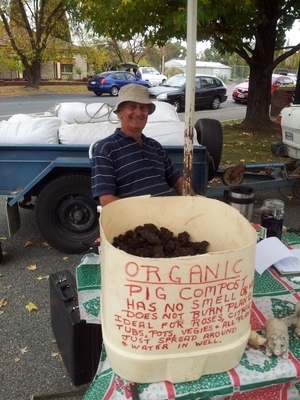 Brian Ness is a Contract Pig Grower from Strathalbyn who regularly attends markets at Woodside, Willunga, Victor harbor, Goolwa, Port Elliot, Stirling and Fullarton, selling his bags of organic manure. Brian Ness's organic pig manure. David Turner is a sheep farmer and potato grower from Mount Torrens and he sells regularly bags of organic sheep manure and bags of Pontiac and Kennebec potatoes at the Woodside Market. 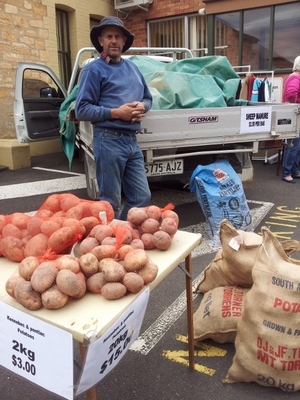 David also offers his potatoes for sale at his roadside stall on Turner Road, Mount Torrens. Healthy snacks for your dog. 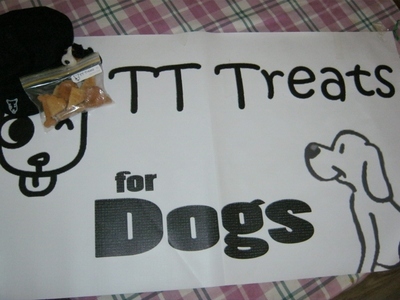 Also, check out the healthy snack food for your dog; it's called PT Treats and it's made from all natural ingredients. David Turner's organic sheep manure and bags of potatoes. If books are your passion then a must to check out is the Lions' Shed located out the back. 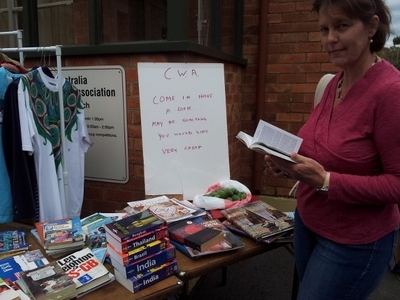 There are always plenty to chose from and every now and then they have a Monster Book Sale incorporating no longer required books from Woodside Library. Why? Enjoy the friendly country atmosphere, the wonderful array of foods, fresh primary produce, plants, gardening products & various craft and clothing items. When: Third Saturday of every month. Where: Woodside Institute Hall, corner of Onkaparinga Valley Road & Nairn Road, Woodside. Cost: Entry is free - costs vary.